London (AFP) - In the high-stakes political chess game that has followed Britain's confusing general election, four women will be making the next moves. 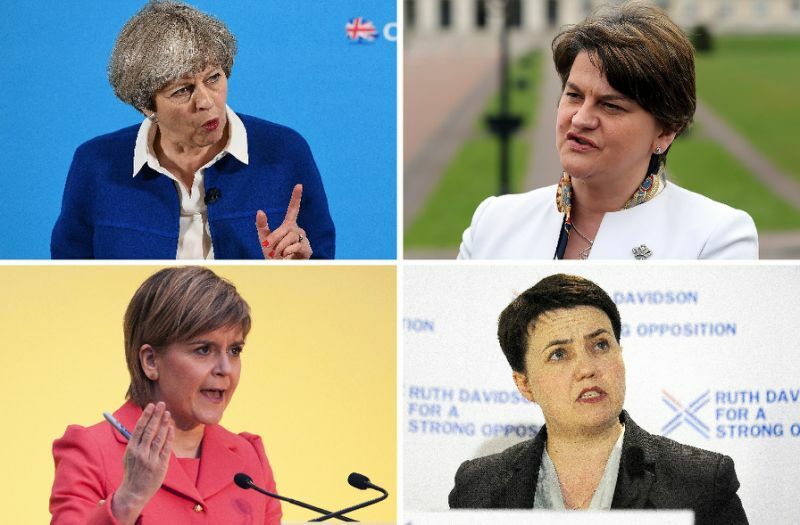 Two of them -- Prime Minister Theresa may and Scottish First Minister Nicola Sturgeon -- are on the back foot following heavy electoral losses. The other two are on the rise -- Arlene Foster, head of the ultra-conservative Democratic Unionist Party, and Scottish Conservative leader Ruth Davidson. Britain's first female prime minister since Margaret Thatcher, who governed from 1979 to 1990, May has distanced herself from the legacy of the "Iron Lady". The current premier's rein is also likely to be considerably shorter, after May's decision to call an election three years early dramatically backfired when the Conservatives lost their majority. An advocate of a "hard" Brexit, committed to Britain leaving the European single market and cutting immigration from the bloc, May ran a campaign focused on her supposedly "strong and stable" leadership ahead of negotiations starting with Brussels. But she failed to inspire voters and came under criticism for appearing cold and stiff, lacking the personal touch despite her high popularity ratings at the start of the election campaign. The 60-year-old vicar's daughter has created an association to promote women in politics and she has boasted of being an inspiration to others, but rarely opens up about her personal motivations. The first female leader of the Scottish National Party, Sturgeon has seen her plans for a second independence referendum shaken by the election results which saw her party lose 21 of its 56 seats. A lawyer by trade who grew up in a working class family, she has championed herself as the voice of the 62 percent of Scots who voted last year to remain in the European Union. Sturgeon, 46, has appealed to Scotland's pro-European sentiment to call for an independence referendum despite voters rejecting such a breakaway in 2014. A frequent critic of everyday sexism in political life, she recently said women have a tougher time when making media appearances. "Every time a woman politician goes in front of a camera, there are maybe 100 things that she has to worry about, consciously or subconsciously, that a man will never have," she told the Gentlewoman magazine. Some reporters are "only interested in our shoes", she added. The head of the Scottish Conservatives, Davidson saw her party gain a dozen seats in the general election. That was in part down to her opposition to Sturgeon's calls for another independence referendum. Cutting a charismatic and jovial figure, the 38-year-old has brought a breath of fresh air to Scottish politics and offers an alternative to the nationalist narrative of the SNP. Davidson is engaged to her Irish partner Jen Wilson and is an outspoken advocate for gay marriage. A unionist politician who boasts kick-boxing skills, Davidson backs a "soft" Brexit in opposition to May's "hard" approach to Britain's EU divorce. "When I was growing up the two most important people in the country were the Queen and Margaret Thatcher, so I thought women could do anything," Davidson told AFP. The first woman to lead the Northern Ireland executive in January 2016, Foster saw her Democratic Unionist Party win 10 seats in Thursday's vote. Despite being head of a small unionist party, Foster will play an instrumental role in Westminster as May has sought the DUP's help to tip the Conservatives into a parliamentary majority. The two parties have some common ground and Foster is pro-Brexit, although cautious of preventing a hard border being imposed between Northern Ireland and the Republic. Foster's politics has been influenced by her experiences during the Northern Ireland conflict. Her father was shot in the head but survived an attack by Irish Republican Army paramilitaries when she was just eight years old and her school bus was blown up when she was 16. Reflecting on her role as a woman in politics, Foster said self-belief was vital. "It's a bit like breaking down old conservative barriers -- one has to believe in oneself, and your ability to move forward," she told AFP.